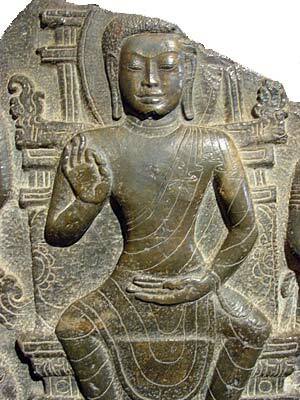 By far the most common sitting posture of Buddha images in Thailand is the 'half-lotus' or 'hero' posture. 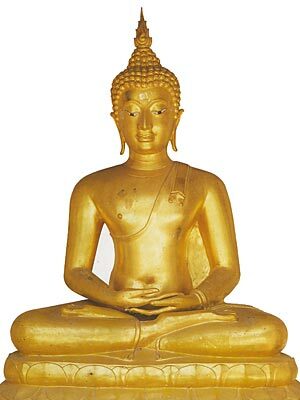 The posture where the Buddha sits in so-called European or Western fashion is also regularly seen, while Buddha images displaying 'full-lotus' posture are somewhat rare in most parts of Thailand. Subduing Mara (Calling the Earth to Witness). 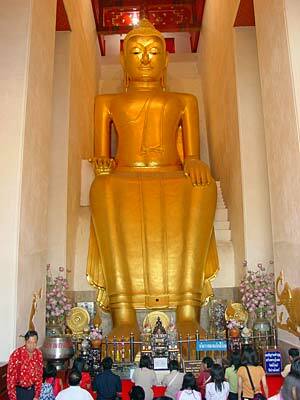 Observe the sitting posture of the Buddha. The RIGHT leg is folded over the left leg. The soles of both feet are upward. This is most correctly called the half-lotus posture (compare with full-lotus posture below). Other names used for this posture are : 'hero posture' or virasana (paryankasana). Meditating in the full-lotus posture. This is also called the diamond posture. Other names used are 'adamantine pose' or Vajrasana. Each foot is resting on the opposite thigh, right leg crossed over the left leg. Notice that the soles of both feet are visible. 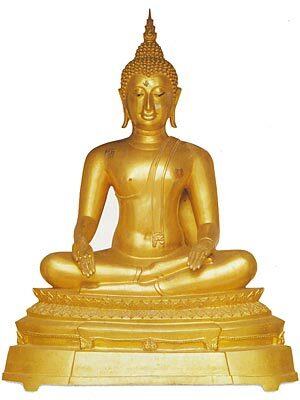 While not that common in Thailand, a Buddha image seated in this way is more likely to be observed in the North of the country, and is common in India.